This whipped cream cheese frosting is a super light and fluffy icing. With only a few ingredients, it comes together easy and is the perfect way to top cupcakes or cakes. Add the cream cheese, confectioners sugar, vanilla and salt to a bowl. Use a whisk attachment if you're using a stand mixer. If you don't have a stand mixer, just use a regular handheld mixer and mix it very well until smooth and creamy. Pour in a small amount of the cold heavy cream. (Only pour in about a 1/4 cup at this point.) Mix well until creamy. Do this two more times (until the rest of the heavy cream is all added). Once everything is incorporated, whip on high until stiff peaks form (about a couple minutes). Add to a cooled cake or cupcakes. Makes enough to cover about 24 cupcakes, or a two layer 8" cake. Because this icing is a whipped frosting, it is on the softer side. Store this frosting in the refrigerator. 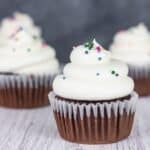 Set the cupcakes, or cake out of the fridge for about 15-20 minutes before serving, so the frosting can get closer to room temp and not as firm. Make sure to check out the TIPS & FAQs for this recipe in the blog post.